Phycoerythrin (PE) is a red protein-pigment complex from the light-harvesting phycobiliprotein family, present in red algae and cryptophytes, accessory to the main chlorophyll pigments responsible for photosynthesis. Like all phycobiliproteins, it is composed of a protein part covalently binding chromophores called phycobilins. In the phycoerythrin family, the most known phycobilins are: phycoerythrobilin, the typical phycoerythrin acceptor chromophore, and sometimes phycourobilin. Phycoerythrins are composed of (αβ) monomers, usually organised in a disk-shaped trimer (αβ)3 or hexamer (αβ)6 (second one is the functional unit of the antenna rods). These typical complexes also contain a third type of subunit, the γ chain. Phycobiliproteins (like phycoerythrin) usually form rods of stacked disks in phycobilisomes. Phycoerythrin is an accessory pigment to the main chlorophyll pigments responsible for photosynthesis. The light energy is captured by phycoerythrin and is then passed on to the reaction centre chlorophyll pair, most of the time via the phycobiliproteins phycocyanin and allophycocyanin. The crystal structure of B-phycoerythrin from red algae Porphyridium cruentum (PDB ID: 3V57 ). The asymmetric unit (αβ)2 on the left and assumed biological molecule (αβ)3. It contains phycoerythrobilin, N-methyl asparagine and SO42−. R-phycoerythrin is predominantly produced by red algae. The protein is made up of at least three different subunits and varies according to the species of algae that produces it. The subunit structure of the most common R-PE is (αβ)6γ. The α subunit has two phycoerythrobilins (PEB), the β subunit has 2 or 3 PEBs and one phycourobilin (PUB), while the different gamma subunits are reported to have 3 PEB and 2 PUB (γ1) or 1 or 2 PEB and 1 PUB (γ2). The molecular weight of R-PE is 250,000 Daltons. Phycoerythrobilin is the typical chromophore in phycoerythrin. It is similar to porphyrin of chlorophyll for example, but tetrapyrrole is linear, not closed into ring with metal ion in the middle. The red algae Gracilaria contains R-phycoerythrin. The crystal structure of phycoerythrin 545 (PE545) from a unicellular cryptophyte Rhodomonas CS24 (PDB ID: 1XG0 ). Colors: chains - alpha-2, alpha-3, beta, beta (helixes, sheets are yellow), phycoerythrobilin, 15,16-dihydrobiliverdin (15,16-DHBV), 5-hydroxylysine, N-methyl asparagine, Mg2+, Cl−. The assumed biological molecule of phycoerythrin 545 (PE545) is (αβ)2 or rather (α3β)(α2β). The numbers 2 and 3 after the α letters in second formula are part of chain names here, not their counts. The synonym cryptophytan name of α3 chain is α1 chain. The largest assembly of B-phycoerythrin (B-PE) is (αβ)3 trimer . However, preparations from red algae yield also (αβ)6 hexamer . In case of R-phycoerythrin (R-PE) the largest assumed biological molecule here is (αβγ)6, (αβγ)3(αβ)3 or (αβ)6 dependently on publication, for other phycoerythrin types (αβ)6. These γ chains from the Protein Data Bank are very small and consist only of three or six recognizable amino acids , whereas described at the beginning of this section linker γ chain is large (for example 277 amino acid long 33 kDa in case of γ33 from red algae Aglaothamnion neglectum) . This is because the electron density of the gamma-polypeptide is mostly averaged out by its threefold crystallographic symmetry and only a few amino acids can be modeled . In phycoerythrin PE545 above, one α chain (-2 or -3) binds one molecule of billin, in other examples it binds two molecules. The β chain always binds to three molecules. The small γ chain binds to none. Two molecules of N-methyl asparagine are bound to the β chain, one 5-hydroxylysine to α (-3 or -2), one Mg2+ to α-3 and β, one Cl− to β, 1-2 molecules of SO42− to α or β. The crystal structure of R-phycoerythrin from red algae Gracilaria chilensis (PDB ID: 1EYX ) - basic oligomer (αβγ)2 (so called asymmetric unit). It contains phycocyanobilin, biliverdine IX alpha, phycourobilin, N-methyl asparagine, SO42−. One fragment of γ chain is red, second one white because it is not considered as alpha helix despite identical aminoacid sequence. The entire oligomer of R-phycoerythrin from Gracilaria chilensis (αβγ)6 (PDB ID: 1EYX ). Excitation and emission profiles for R-Phycoerythrin from two different algae. Common laser excitation wavelengths are also noted. As mentioned above, phycoerythrin can be found in a variety of algal species . As such, there can be variation in the efficiency of absorbance and emission of light required for facilitation of photosynthesis. This could be a result of the depth in the water column that a specific alga typically resides and a consequent need for greater or less efficiency of the accessory pigments. With advances in imaging and detection technology which can avoid rapid photobleaching, protein fluorophores have become a viable and powerful tool for researchers in fields such as microscopy, microarray analysis and Western blotting. In light of this, it may be beneficial for researchers to screen these variable R-phycoerythrins to determine which one is most appropriate for their particular application. Even a small increase in fluorescent efficiency could reduce background noise and lower the rate of false-negative results. R-Phycoerythrin (also known as PE or R-PE) is useful in the laboratory as a fluorescence-based indicator for the presence of cyanobacteria and for labeling antibodies, most often for flow cytometry. Its use is limited in immunofluorescence microscopy due to its rapid photobleaching characteristics. There are also other types of phycoerythrins, such as B-Phycoerythrin, which have slightly different spectral properties. B-Phycoerythrin absorbs strongly at about 545 nm (slightly yellowish green) and emits strongly at 572 nm (yellow) instead and could be better suited for some instruments. B-Phycoerythrin may also be less "sticky" than R-Phycoerythrin and contributes less to background signal due to non-specific binding in certain applications. However, R-PE is much more commonly available as an antibody conjugate. R-Phycoerythrin and B-Phycoerythrin are among the brightest fluorescent dyes ever identified. ^ a b c d e Ficner R, Huber R (November 1993). "Refined crystal structure of phycoerythrin from Porphyridium cruentum at 0.23-nm resolution and localization of the gamma subunit". European Journal of Biochemistry. 218 (1): 103–6. doi:10.1111/j.1432-1033.1993.tb18356.x. PMID 8243457. ^ a b c van der Weij-De Wit CD, Doust AB, van Stokkum IH, Dekker JP, Wilk KE, Curmi PM, Scholes GD, van Grondelle R (December 2006). "How energy funnels from the phycoerythrin antenna complex to photosystem I and photosystem II in cryptophyte Rhodomonas CS24 cells" (PDF). The Journal of Physical Chemistry B. 110 (49): 25066–73. doi:10.1021/jp061546w. PMID 17149931. Archived from the original (PDF) on 30 October 2013. ^ Six C, Thomas JC, Garczarek L, Ostrowski M, Dufresne A, Blot N, Scanlan DJ & Partensky F (2007). "Diversity and evolution of phycobilisomes in marine Synechococcus spp. : a comparative genomics study". Genome Biology. 8 (12): R259. doi:10.1186/gb-2007-8-12-r259. PMC 2246261. PMID 18062815. ^ Glazer AN (1985). "Light harvesting by phycobilisomes". Annual Review of Biophysics and Biophysical Chemistry. 14: 47–77. doi:10.1146/annurev.bb.14.060185.000403. PMID 3924069. ^ a b Camara-Artigas, A. (2011-12-16). "Crystal Structure of the B-phycoerythrin from the red algae Porphyridium cruentum at pH8". RCSB Protein Data Bank (PDB). doi:10.2210/pdb3v57/pdb. PDB ID: 3V57. Retrieved 12 October 2012. ^ a b Camara-Artigas A, Bacarizo J, Andujar-Sanchez M, Ortiz-Salmeron E, Mesa-Valle C, Cuadri C, Martin-Garcia JM, Martinez-Rodriguez S, Mazzuca-Sobczuk T, Ibañez MJ, Allen JP (October 2012). "pH-dependent structural conformations of B-phycoerythrin from Porphyridium cruentum". The FEBS Journal. 279 (19): 3680–3691. doi:10.1111/j.1742-4658.2012.08730.x. PMID 22863205. PDB ID: 3V57. ^ a b c d Image created with RasTop (Molecular Visualization Software). ^ "Protein Data Bank". RCSB Protein Data Bank (PDB). Archived from the original on 28 August 2008. Retrieved 12 October 2012. ^ Doust, A.B. ; Marai, C.N.J. ; Harrop, S.J. ; Wilk, K.E. ; et al. (2004-09-16). "High resolution crystal structure of phycoerythrin 545 from the marine cryptophyte rhodomonas CS24". RCSB Protein Data Bank (PDB). doi:10.2210/pdb1xg0/pdb. PDB ID: 1XG0. Retrieved 11 October 2012. ^ Doust AB, Marai CN, Harrop SJ, Wilk KE, Curmi PM, Scholes GD (November 2004). "Developing a structure-function model for the cryptophyte phycoerythrin 545 using ultrahigh resolution crystallography and ultrafast laser spectroscopy". Journal of Molecular Biology. 344 (1): 135–53. doi:10.1016/j.jmb.2004.09.044. PMID 15504407. PDB ID: 1XG0. ^ a b c d Contreras-Martel, C.; Legrand, P.; Piras, C.; Vernede, X.; et al. (2000-05-09). "Crystal structure of R-phycoerythrin at 2.2 angstroms". RCSB Protein Data Bank (PDB). doi:10.2210/pdb1eyx/pdb. PDB ID: 1EYX. Retrieved 11 October 2012. ^ a b c d Contreras-Martel C, Martinez-Oyanedel J, Bunster M, Legrand P, Piras C, Vernede X, Fontecilla-Camps JC (January 2001). "Crystallization and 2.2 A resolution structure of R-phycoerythrin from Gracilaria chilensis: a case of perfect hemihedral twinning". Acta Crystallographica D. 57 (Pt 1): 52–60. doi:10.1107/S0907444900015274. PMID 11134927. PDB ID: 1EYX. ^ Apt KE, Hoffman NE, Grossman AR (August 1993). "The gamma subunit of R-phycoerythrin and its possible mode of transport into the plastid of red algae". The Journal of Biological Chemistry. 268 (22): 16208–15. PMID 8344905. ^ Ritter, S.; Hiller, R.G. ; Wrench, P.M.; Welte, W.; et al. (1999-01-29). "Crystal structure of a phycourobilin-containing phycoerythrin". J. Struct. Biol. 126 (2): 86–97. doi:10.2210/pdb1b8d/pdb. PMID 10388620. PDB ID: 1B8D. Retrieved 14 October 2012. ^ Ritter S, Hiller RG, Wrench PM, Welte W, Diederichs K (June 1999). "Crystal structure of a phycourobilin-containing phycoerythrin at 1.90-A resolution". Journal of Structural Biology. 126 (2): 86–97. doi:10.1006/jsbi.1999.4106. PMID 10388620. 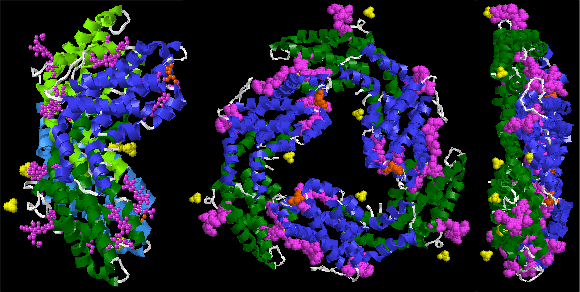 PDB ID: 1B8D.